This walk ascends Grand Som from the east (map). It explores the eastern flanks of the mountain, starting from la Coche, a kilometres or so from St. Pierre de Chartreuse, reaching the south ridge at the col du Frenay, and descends towards the col du Cucheron via the col des Aures. The time is for the ascent and descent. 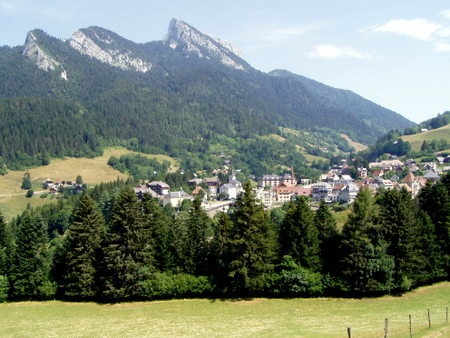 La Coche may be found by following the D512 from St. Pierre de Chartreuse towards the col du Cucheron for about 1300 metres. A road descends left towards the river, over a bridge, and through the small hamlet. You can park your car at the top of the village at a forestry turning point (960 m, grid ref. UTM 31T 72074 50259). Follow the forestry track uphill into the woods. There's a junction after 20 minutes or so - keep right. The path is accompanied by occasional red and yellow way-markings. After a further 30 minutes, the way divides, with an overgrown track off to the right, and our path off to the left. The path now zig zags its way up to the col du Frenay. This path is not always in that good a condition, as the gully that leads to the col has been used as a forestry slide, half-destroying the path as it crosses it. Some people have been tempted to follow the steep slide, but this is unsatisfactory, and it is worth persevering with the path. This is one place which is in need of some urgent path renovation by the Regional Park authorities. The col is reached about an hour and a half after leaving the car. After five minutes or so, the path crosses to the west of the ridge, and continues its ascent beneath limestone cliffs. Marmots abound here: their burrows lie alongside the path, and they can be heard screaming their warnings from their rocky vantage points. The path then swings round to the left, across a system of ledges and up some small crags, as it rises once again to the ridge. There is some exposure here, and the use of hands is required. The ridge is reached some two and half hours after leaving the car. From here, there are two routes to the summit. If you have a reasonable head for heights, and conditions are dry, you can follow an exhilarating scramble along the ridge (Grade 2), which makes an uncompromising beeline for the summit. The other route drops down a few metres from the ridge, and then traverses pleasantly across the rocky flanks of the hillside. The flora in this area is outstanding. Twenty minutes after leaving the ridge, you meet a path coming up from the right. Make a note of it, as this is our descent route. The path then enters a rocky gully, and when it exits, ascends the steep flank to the summit cross, which is reached some 45 minutes after leaving the ridge. The summit is a good place for lunch. As you would expect, the views are superb, and below, to the south-west, you can see the monastery nestling in the secluded St. Bruno valley. Unfortunately, the summit is now the home of a very naff viewpoint station consisting of two halves of a concrete Chartreuse. We start the descent by retracing our steps down the flanks, and back through the gully. Some 20 minutes after leaving the summit, you meet the junction noted previously. Turn left, and continue down the flanks. A pleasant descent down some cliffs to the col des Aures follows, cable-assisted in places. The col is a superb spot, with some wonderful views towards the Guiers Vif gorge through the hidden valley to the north. The path then descends through the forest, and some forty minutes from the col, a junction is reached within a clearing. Left goes towards the col du Coucheron, and right returns us back to la Coche. Beware, between here and la Coche are some misleading Regional Park signposts giving absurd timings! Twenty minutes from the junction, the path turns into a track, and 100 metres later, a yellow way-marked path goes off to the right past a reservoir. Follow this. After a further 20 minutes, you'll find a signpost for la Coche by a stream. You follow the path across the stream a couple of times, before emerging on the road some two hours of so after leaving the summit. The car is two minutes up the road to the right.